Banks should cap unarranged overdraft fees and warn customers before they go overdrawn, the competition watchdog has said. 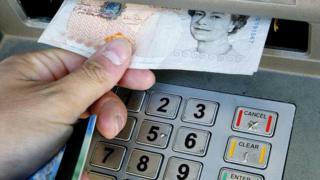 The Competition and Markets Authority says this and other measures could save bank customers £1bn over five years. The provisional conclusions of the 18-month study into personal and business banking suggest competition is weak in the industry. But consumer group Which? said the report was a missed opportunity. Many banks already cap overdraft fees, but the CMA said some do not. At one end of the scale, Barclays charges a maximum of £35 a month. At the other end, Halifax charges a maximum of £100. The average unauthorised overdraft fee - when the bank has not agreed to a customer going overdrawn - is £57.50 a month, according to Moneyfacts. At that average fee, if someone were to go overdrawn every month they could end up paying £690 a year. Interest is charged daily on top of that, at an average annual rate of 12.85%. The CMA said that UK banks made £1.2bn from such charges in 2014. Overall, 60% of customers have stayed with the same bank for more than 10 years, and 90% of business customers get their loans from banks where they have their own current account. The price of loans should be more transparent, to help business customers. The CMA said that if customers switched accounts, they could on average save £116 a year. Those who use unauthorised overdrafts could save £153. The competition body confirmed its earlier finding that the biggest banks should not be broken up, as that would not "significantly improve" the market. Alasdair Smith, chair of the CMA's Retail Banking Investigation, said: "For too long, banks have been able to sit back and not work hard enough for their personal and small business customers." Mr Smith told BBC Radio 4's Today programme: "The banking market is not working well for customers or for small businesses at the moment, primarily because it's very hard for customers to work out what their bank really costs them." He said that the best bank for someone depended on how they used their bank account, so technology would put together information about an individual's bank usage and charges and point people in the right direction of better offers. However, consumer group Which? criticised the findings of the inquiry. Alex Neill, Which? director of policy and campaigns, said: "After 18 months, this inquiry achieved little more than to propose basic information measures that the big banks should have introduced years ago. "Steps to stimulate switching are welcome but the chance to deliver better banking for all consumers has been missed," she added. She said the Financial Conduct Authority should "tackle the unfair, punitive charges faced by unauthorised overdraft users, some of whom are hit with fees far in excess of payday loans." However, the British Bankers' Association (BBA) welcomed the report. "Capping monthly overdraft fees will help customers better manage their finances and raising awareness of the current account switching service will help more people realise they can switch accounts easily and quickly," said Anthony Browne, chief executive of the BBA. The CMA is expected to deliver its final recommendations by August this year. Have you been affected by the issues in this story? Have you been charged for an unauthorised overdraft? Let us know about your experiences. Email haveyoursay@bbc.co.uk with your stories.